Art has been an outlet for people for hundreds of years. Art can express a person's inner feelings, beliefs or desires. Art can be dated back to 40,000 years ago, to an Indonesian "stencil" like piece of art. This art is considered ancient graffiti, even though it was 40,000 years ago. Graffiti can be traced back to ancient times, not only in Indonesia but also other ancient empires such as Greece and Rome. When stencil art is spoken about today the first name that comes to mind is Banksy. Banksy has made his trademark on the world with his unique stencils. In 2015, Banksy is considered one of the biggest and greatest street artist of all time. Banksy has some of the most controversial pieces of art in modern time. He has been sharing his ideas and beliefs for over 10 years, but it hasn't been until recent times that Banksy has taken to social media to get his voice heard. The media has portrayed Banksy as many different things, a criminal and just a street artist trying to express himself through his art. He started off as a graffiti artist, as part of a graffiti crew. As time went on, he began to brand his stencil street art rather than doing just graffiti. But Banksy recently began to share his beliefs via social media. In the summer of 2014 Banksy shared his first film, "Banksy Does New York" a special film that captured his beliefs on camera. It was a one month special of Banksy doing various art all over New York City, from huge murals to live interactive artwork. This film was extraordinary because Banksy has always been such a private person despite all his public art. Even throughout the film, Banksy’s identity wasn’t shown. For the first time he displayed his art live for people to be able to react on camera. He was not physically in the movie but all of his live art and murals were. Banksy is known for being bold in all of his artwork. Banksy being a bold street artist out of Bristol, United Kingdom, has made his art go international. He has put his art all over the world from New York to the Middle East and everywhere in between. Banksy’s art is very controversial because he touches on very sensitive topics that are normally tip toed around. Banksy can be heavily connected to many social justice issues because he is a very well-known activist. He has been very active in expressing his views on some of the biggest justice issues of this generation, from occupy Wall Street to immigration. He is very popular for his art on capitalism and using apes and rats to express his feelings. His art normally has very odd slogans that are not what the paintings would first make you think. He has traveled the world to put his work on very controversial places. He has one of his most famous pieces on the West Bank Barrier, the wall between Palestine and Israel. The mural is of a man ripping the wall and looking over at the other side; the wall is specifically there to keep people on their side of the wall. This mural made media go up in a frenzy; he painted something so symbolic: the division of two countries who have been at war for years. Banksy has made his imprint on the world with his art but also within the social justice community. His trip to Palestine, to the Gaza strip, was well needed and also very controversial. He climbed through old underground tunnels where he ended up inside the walls of the Gaza Strip. He displayed such hopeful art in blown up and destroyed houses where he did murals displaying hope. 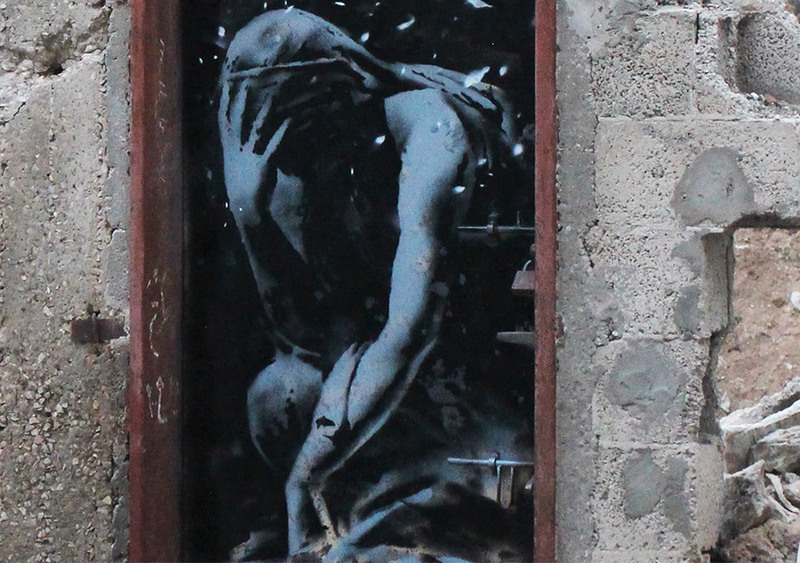 In a brief YouTube video Banksy made, he shows his trip to the Gaza Strip. In the video he shows children running around and playing in the rumble of the town and they reinforce his idea of hope in his murals.